Highly anticipated: If you're a fan of singleplayer RPGs, you may have heard of Obsidian. The game development studio is best known for the creation of high-profile (not to mention well-received) titles like Fallout: New Vegas and Pillars of Eternity. 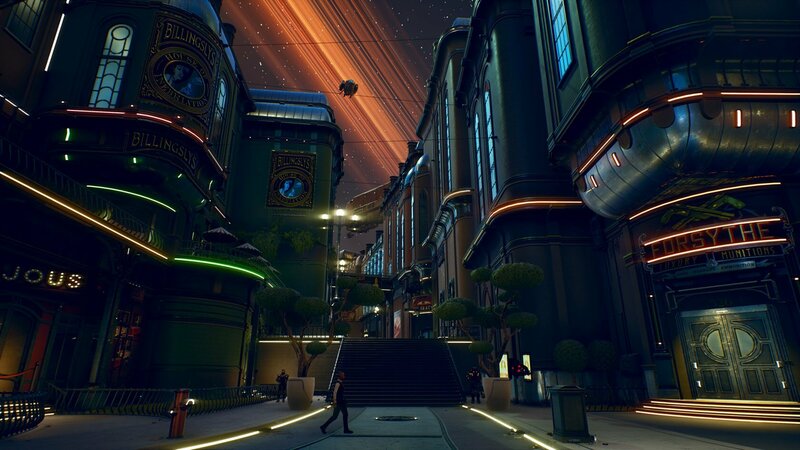 As a result of this history, the studio's announcement of The Outer Worlds last year has sparked quite a bit of excitement from fans. Of course, there's also a good chance that the somewhat-disastrous launch of Bethesda's Fallout 76 has helped the Outer Worlds Gain traction. Regardless, for the unaware, The Outer Worlds is a singleplayer RPG with a Fallout: New Vegas-like approach to storytelling and player freedom. The game also features a companion system, stat-based combat, and a beautifully-unique sci-fi universe for players to explore. Details about the game haven't exactly been kept a secret (extended gameplay clips hit the web shortly after the game's announcement), but we've just received a particularly massive info dump this week. Game Informer took a trip to Obsidian's headquarters to interview project leads Tim Cain and Leonard Boyarsky (the original creators of Fallout) about their upcoming game. Thanks to a series of articles and videos published by the outlet (with more to come), we now have much more insight into the game's development philosophy, pricing, and expected release formats. For starters, The Outer Worlds will be coming to the Xbox One, PlayStation 4, and PC both physically and digitally with a retail price of $60. Console users will be able to enjoy the game in 4K if they have the system and TV to support it. When asked whether or not the game would have microtransactions, Cain and Boyarsky were quick to reply with a firm "Hell, no," though it's unclear if it will ship with a collector's edition. The Outer Worlds will be first-person only (sorry, Bethesda fans) with a full day-night cycle and what sounds like a reasonably in-depth character creation system; complete with presets for convenience and sliders for fine-tuning. At the start of the game, players will put points into various skills, with an NPC commenting on each choice they make (a la Doc Mitchell from New Vegas). Players will be able to go through most of the game (or perhaps even all of it) without killing a single person, or they can go the opposite direction and slaughter virtually everybody they meet. Players will be able to go through most of the game (or perhaps even all of it) without killing a single person, or they can go the opposite direction and kill virtually everybody they meet. Either way, in-game factions will react to your decisions, and the reputation system will govern how other characters view you. Speaking of choices and consequences, Cain and Boyarsky claim The Outer Worlds will feature "lots" of endings, but an exact number was not given. In addition to factions reacting to your character's choices, The Outer World's many player companions will do the same. Each of them will have their own unique likes, dislikes, and side quests the player can take on to improve the loyalty and combat abilities of their pals. Daredevils be warned, however: if you play on the hardest difficulty (Supernova), your companions can be permanently killed if downed in combat. On other difficulties, they merely go into a "wounded" state and can be revived relatively easily. The final thing worth noting is that The Outer Worlds will have plenty of humor. Of course, given the footage we've already seen of the game and Obsidian's track record, that doesn't really come as a surprise. If all of this sounds like your cup of tea, you won't have to wait long to try The Outer Worlds for yourself. Boyarsky and Cain "personally guarantee" that the game will launch in 2019, though we don't know precisely when (we'll probably learn more at or before E3 2019).